Brig. Leopold Kyanda has been reappointed UPDF Chief of Staff Land Forces. File photo. Brig Leopold Kyanda has been reappointed UPDF Chief of Staff Land Forces. The appointment comes just months after he graduated from the National Defence College in India. 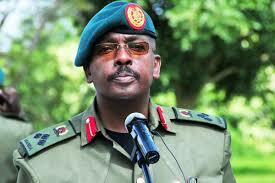 Kyanda was first appointed to the position in May 2013, replacing then Maj. Gen. Charles Angina (now Lt. General). In December last year, he was sent for a refresher course in India and was replaced by Brig. Geoffrey Katsigazi. In a related development, Brig Kayanja Muhanga has been appointed second Division Commander after a tour of duty as Contingent Commander under AMISOM. Muhanga was by Brig Paul Lokech who started work on Wednesday. Brig. Muhanga served as Contingent Commander for the past one year.